ALMOST 40,000 units of donated blood have been wasted in Northern Ireland during the last five years, while other components of blood donations have been sold for commercial use for almost half a million pounds, The Detail can reveal. Donated blood is used by hospitals to save lives in emergency situations or for people who need long-term treatment. Every year in Northern Ireland around 64,000 blood donations are received, and it is estimated that three lives are saved for every pint of blood donated. 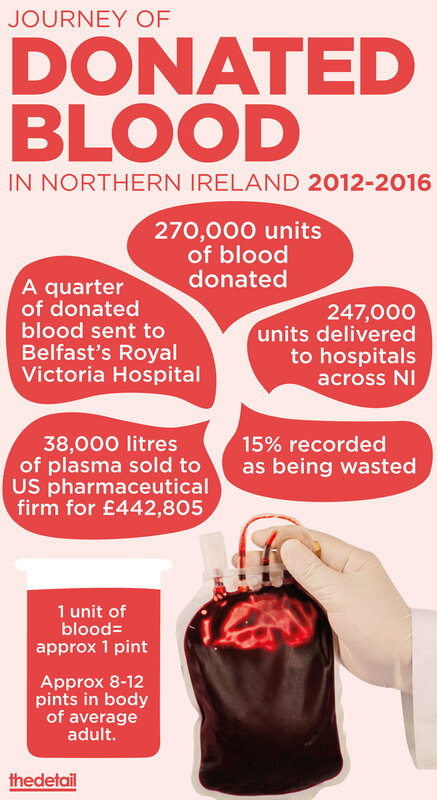 The vast majority of blood donations are used within the health service, with almost 250,000 units of donated blood delivered to hospitals throughout Northern Ireland since 2012. However new figures compiled by The Detail show that during the same time period 15% of donated blood was recorded as being “wasted” in Northern Ireland. Comparative figures for Scotland show that the amount of blood estimated to be donated but not used during the same time period was almost 11%. A unit of blood is the equivalent of approximately one pint and there are between 8 to 12 pints of blood in the body of an average adult. Around 500 patients need lifesaving blood each week in Northern Ireland, with donations from the public vital. ‘Wasted blood’ is a regionally accepted term referring to any unit of blood that cannot be transfused to a patient for a variety of technical reasons such as faults in storage conditions or time expiry. The figures obtained by The Detail show that around half of the blood wastage occurred when stocks were being maintained at transfusion headquarters and the remaining wastage occurred at hospitals across Northern Ireland. Our data does not include figures for the South Eastern Health Trust so the true loss will be even higher. Different computer systems are currently being used by NIBTS and the various hospitals to manage the collection and distribution of blood. In a statement NIBTS acknowledged that a single computer system could help reduce wastage. Reacting to The Detail's findings the Department of Health acknowledged efforts were under way to address the differences in computer systems. A spokesperson said: “The Department looks to NIBTS and the HSC Trusts to ensure that donated blood is used efficiently and that effective distribution and storage arrangements are in place. "However, we recognise that a more integrated approach to managing resources across all pathology services provided by the HSC, including the blood transfusion service, would further enhance the quality and efficiency of the service." NIBTS says that as part of the production of red blood cells for transfusion the liquid portion of blood known as plasma is removed. While some of it is used for patients, the remainder is usually considered as a surplus for patient safety reasons based on best clinical practice and can therefore be sold. Individuals may request on their donor forms that their blood is not used for research or commercial purposes. 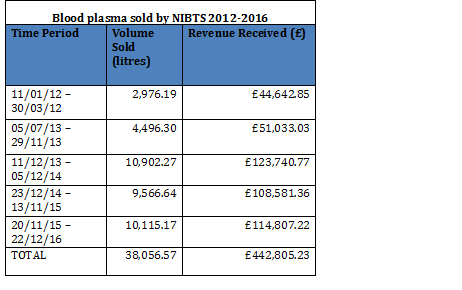 But further figures obtained by The Detail show that between 2012 and 2016 over 38,000 litres of plasma from Northern Ireland were sold to US pharmaceutical and Biotech Company Nova Biologics for £442,805. The blood plasma can then be sold onto pharmaceutical companies for medical testing and for research, including examining ways to improve medical care and diagnosis. In July this year Northern Ireland pharmaceutical company Randox was awarded the contract to purchase surplus blood plasma from NIBTS. NIBTS said that all funds generated from the selling of blood plasma are invested back into the Department of Health and that this also saves money on disposing of it as waste. According to the Northern Ireland Blood Transfusion Service, blood is made up of a number of elements including red blood cells, platelets, plasma and white blood cells, collectively referred to as blood components. NIBTS say platelets are what enable blood to clot and prevent excessive bleeding. Plasma is the liquid part of the blood that has had platelets and red and white blood cells removed. Red blood cells are the more frequently used part of blood for transfusions. The Northern Ireland Blood Transfusion Service (NIBTS) is responsible for the collection of blood voluntarily donated by the public. It operates three mobile teams at around 250 locations as well as a permanent donation suite at its headquarters based in Belfast City Hospital. Approximately 1,000 donation sessions are held each year. 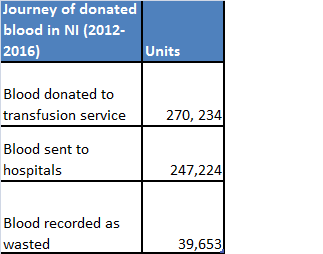 Under Freedom of Information legislation we asked for a breakdown of blood donated to NIBTS and issued to hospitals across Northern Ireland between 2012 and 2016. Click here to view the number of units issued to each hospital as well as the type of blood donated. The figures show that overall there were 270,234 units of blood donated to the NIBTS during this time period. There were 3,000 units of Haemochromatosis donations. Haemochromatosis is a medical condition where iron levels build up. Patients with haemochromatosis have blood removed to alleviate the symptoms. This blood can be used for donation providing the donor meets the criteria for NIBTS donation. Excluding these special blood donation groups, the total volume of whole blood donations for general use amounts to 267,000 units between 2012-2016. Of the 270,234 blood donations made to NIBTS, 247,224 units were sent to hospitals across Northern Ireland. NIBTS also confirmed that it recorded 22,648 units of donated blood as being “wasted” when it was in possession of it. This equates to 8% of the blood donated to NIBTS. Through a series of Freedom of Information requests to each of Northern Ireland’s health trusts we also established that during the last five years a further 17,005 units of blood were recorded as wasted after they had been sent to hospitals across Northern Ireland. This increases the overall percentage of recorded blood wastage over the last five years to almost 15%. The South Eastern Trust was not included in our wastage figures because it could only provide data in financial years and not calendar years and therefore covered a different time period than the remaining trusts. 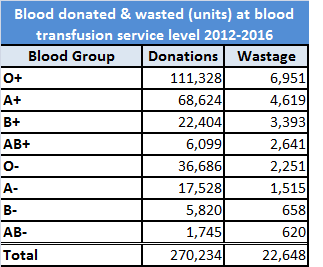 The Belfast Trust had the largest recorded wastage of blood with 12,371 units recorded as wasted. In a statement a spokesperson for the Belfast Trust said: “Trust Blood Banks need to maintain stock levels to be able to manage routine and unforeseen situations. If the blood is not used before its expiry date it will be disposed of. We requested similar figures from each of the blood transfusion services across the UK and the Republic of Ireland. Only the Scottish National Blood Transfusion Service (SNBTS) provided the data. Between 2012 and 2016, 6.5% of blood donated to SNBTS could not be transfused for various reasons such as loss due to technical problems during processing. The SNBTS does not routinely record the exact volume of unused blood by hospitals in Scotland, but it said that from a sample of sites it estimates that approximately 4% of blood donations issued to Scottish hospitals are not transfused. This brings the overall approximate percentage of donated blood not used in Scotland to around 10.5% compared to 15% in Northern Ireland. There can be a number of technical reasons why donated blood may be wasted such as faults or leakages in blood packs, equipment failure and in some cases abnormal test results or other medical reasons that become apparent after donation. Blood can be discarded due to time expiry. The transfusion service says some natural wastage is inevitable as blood banks need to maintain stock levels. In a statement to The Detail the transfusion service said standardisation and investment in technology could help reduce donated blood wastage. No blood establishments across the UK freeze blood therefore in Northern Ireland blood is not normally frozen. The transfusion service says liquid whole blood is preferred for transfusion to patients as the technical process involved in getting frozen blood ready for transfusion can lead to a loss of one third of the blood cells. 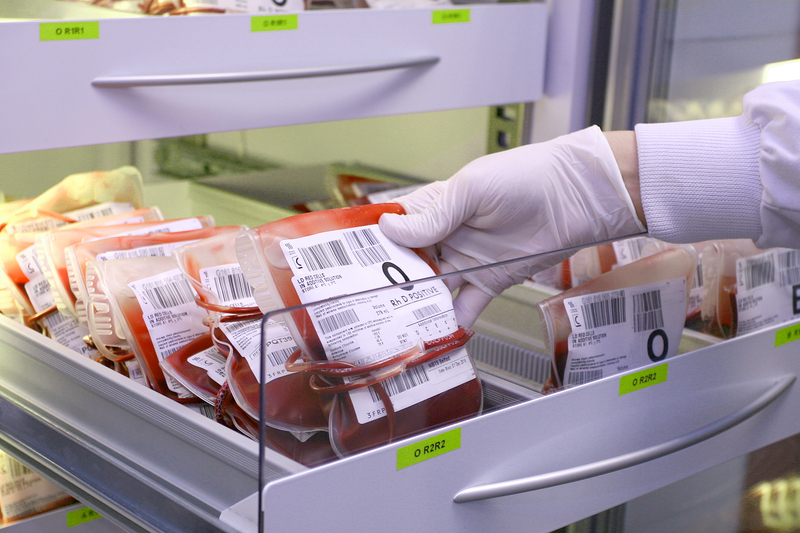 However when blood of a very rare type is not readily available, it can be frozen for potential future use at the National Red Cell Frozen Bank in Liverpool. According to NIBTS, during the preparation of red cells for transfusion the liquid portion of blood known as plasma is removed. Modern medical practice commonly only uses platelets, plasma and red blood cells in the transfusion process. The transfusion service says that while some of this plasma can be issued for transfusion in patients the remainder of the plasma for patient safety reasons based on best clinical practice is surplus, and in Northern Ireland it is being sold to commercial companies. Prior to 2008 plasma was incinerated in Northern Ireland and the transfusion service says it incurred a charge for disposal. However as there is a commercial market for blood plasma, since 2008 it has been sold by NIBTS to the pharmaceutical industry with the profit re-invested back into the Department of Health. The consent form which blood donors in Northern Ireland fill in does make reference to the fact that blood plasma can be sold. Donors may request that their blood is not used for research or commercial use on their donor sessions slip. In recent years blood plasma from Northern Ireland was sold to US pharmaceutical firm NOVA Biologics. The company describes itself as a “global provider of pharmaceutical and biological products and raw materials to clinical laboratories, research organizations, diagnostic test kit manufacturers, and pharmaceutical companies”. We contacted the company and asked for more specifics regarding what it did with the blood plasma when it purchased it, but we did not receive a response. In July this year the NIBTS plasma contract was retendered and was awarded to Belfast healthcare diagnostic firm Randox. Randox had previously held the contract along with Nova Biologics from 2008-11 where when they spent a combined total of £878,000 on purchasing plasma from Northern Ireland during this period. We asked Randox what it used the blood product it purchased from NIBTS for. A spokesperson said: “NIBTS excess plasma is used to manufacture quality control materials for hospital blood-science analysers. Randox quality control materials are manufactured, through extensive processing, with very accurate levels of markers of disease which allows laboratory staff to test the accuracy of their blood tests before a patient is given a diagnosis. Donated blood is often used by hospitals to save lives in emergency situations or for people who need long-term treatment. Every year in Northern Ireland around 64,000 blood donations are received, and it is estimated that three lives are saved for every pint of blood donated. A unit of blood is the equivalent of approximately one pint and there are between 8 to 12 pints of blood in the body of an average adult. Around 500 patients need lifesaving blood each week in Northern Ireland. NIBTS say that as part of the production of red blood cells for transfusion the liquid portion of blood known as plasma is removed. While some if it is used for patients, the remainder is usually considered as a surplus for patient safety reasons based on best clinical practice and can be sold. The blood can then be sold onto pharmaceutical companies for medical testing and research. In July this year Northern Ireland pharmaceutical company Randox was awarded the contract to purchase surplus blood from NIBTS.